CNBC personality is fond of saying that there’s always a bull market somewhere. He certainly seems to be correct. There always appears to be a market that is going up. It might be a sector in the U. S. stock market, or the equity market in a foreign country or a commodity market. Although he might not say, there is at least one corollary to Cramer’s observation. It’s equally likely to be true that there is always a bear market somewhere. And, as investors who follow the news may know, there always seems to be a crisis somewhere. For crisis hunters, Europe has been an almost constant source of problems. Greece is a well known hot spot with bailouts propping up the country financially and the stock market showing the financial stress. Global X MSCI Greece ETF (NYSE: GREK) is an exchange traded fund, or ETF, that tracks the Greek stock market and is one way for investors in the U. S. to trade that market. The ETF is more than 60% below its 2014 high, a sign that investors believe the country still hasn’t recovered. But, Greece is just one potential crisis in Europe. In recent weeks, investors have turned their attention to Italy. One forward looking indicator of the economic strength or weakness in a country is the bond market. In Italy, that market is warning investors of potential problems. 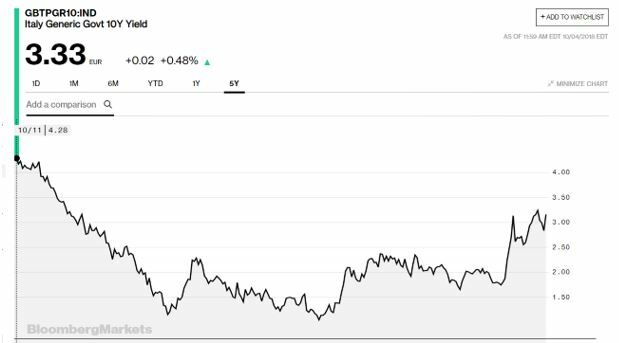 Interest rates on benchmark 10 year government bonds are at multiyear highs and have moved sharply higher in recent weeks, an indication of a rapid change in the perception of the market. One expert who has been following the market closely is Bill Witherell of Cumberland Advisors. He believes the political situation in the country is important to watch. Those programs will be expensive to deliver and that showed up in the coalition’s budget proposal. “The projected budget deficit of 2.4% of GDP for each of the next three years is three times the 0.8% deficit target for 2019 agreed with the European Commission last year, with improvements to 0.0% predicted for 2020 and a 0.2% surplus for 2021. The Italian government has to submit a draft budget to the European Commission no later than October 15.” That sets a deadline and could set off an intense market reaction as the date nears. “The most immediate concerns about these developments relate to Italy’s banking sector. Declining values in the Italian bond market erode the balance sheets of Italian banks. At the end of last year Italian government bonds were reported to account for about 10% of Italian bank assets. In the second quarter of this year Italian banks increased their holdings of Italian government debt by more than 40 billion euros as foreign investors fled the market. Italian banks are thought to hold over $440 billion in Italian bonds. The Italian Economy Minister, Giovanni Tria, argues that this isn’t a long term problem. He believes that, in effect, Italy will be able to grow its way out of the deficits and that the programs proposed in the budget will contribute to growth. He forecast growth of 1.6% in 2019 and 1.7% in 2020. Growth was 1.6% in 2017. This year the economy looks likely to achieve growth of about 1%. Tria could be optimistic. The European Commission expects Italy’s economic growth to be about 1.1%. Other experts agree that the economy is lower than Italy’s government acknowledges. 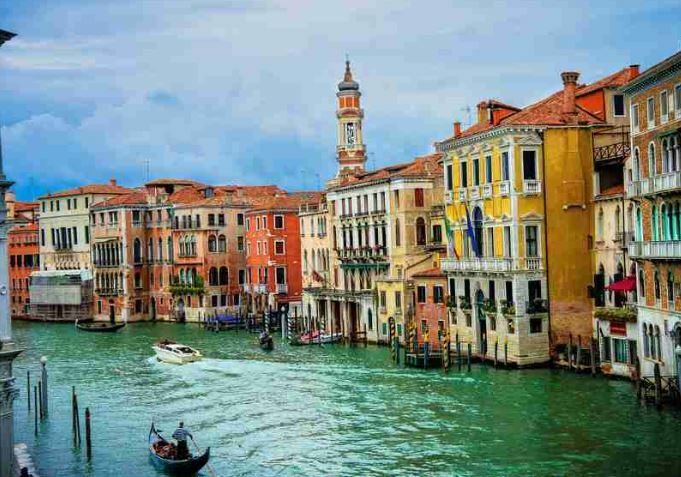 According to Markit, the Italian economy appears to have stagnated in the third quarter. The manufacturing sector has weakened through the year with overall growth relying increasingly on a still strong service sector. Domestic demand is weak with depressed real incomes. Forward-looking indicators suggest very little growth in the fourth quarter. Italy’s stock market is now showing weakness. U.S. based investors can gain exposure to the Italian stock market with the iShares MSCI Italy Capped ETF (NYSE: EWI). The monthly chart below shows that this market may have reached a significant top last year and it is now about 15% below that high. One way to benefit form a decline in prices is sell the ETF short. This requires borrowing shares from your broker to sell and eventually buying the shares back to repay that loan. If EWI falls before the shares are bought, the position will show a gain. However, there are a number of risks associated with short selling. The loan can technically be called by the broker at any time and the loan does carry a cost that can vary with market conditions. It is possible these factors could work against a trader with a short position. Put options can also benefit from a decline in value. A buyer of a put option has the right, but not the obligation to sell 100 shares at a predetermined price until a prespecified date. Put options can deliver large gains and buyers of the options have risk limited to the purchase price of the options. It is possible the crisis in Europe will worsen and Italy could be one of the biggest problems. That means put options could deliver large gains and could be a hedge against a market crash in that region.